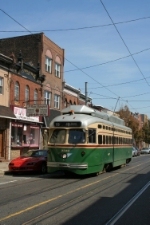 Description: Septa streetcar 2323 gets ready to charge eastbound across 33rd Street on the Route 15 at Girard Avenue. Description: Eastbound on Girard Avenue Septa Route 15 is this PTC scheme PCC trolley. Description: A route 15 PCCII rolls along Girrd Ave. toward the Front St. stop. Description: A route 15 PCCII rolls along Richmond St.